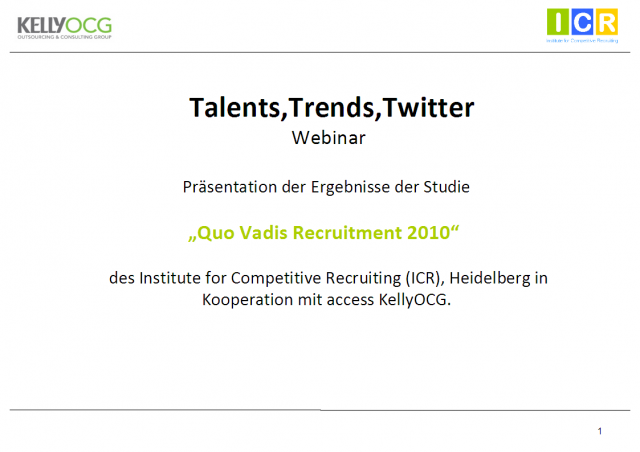 Presentation of the results of the survey “Recruitment Trends 2010” carried out by the Institute for Competitive Recruiting (ICR) Heidelberg, Germany in cooperation with access KellyOCG. Learn more about current developments in the HR Business like Social Media Recruiting and Employer Branding with the focus on the German market. Präsentation der Ergebnisse der Studie „Recruitment Trends 2010“ im Auftrag des Institute for Competitive Recruiting (ICR), Heidelberg in Kooperation mit access KellyOCG. Erfahren Sie mehr über aktuelle Entwicklungen und Trends in der Personalbranche wie Social Media Recruiting oder Employer Branding.